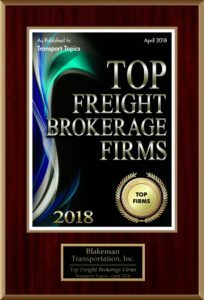 2018 Top Freight Brokerage Firms - Blakeman Transportation, Inc.
Blakeman Transportation Inc. is honored and appreciative of the recognition “Top Freight Brokerage Firms 2018” by Transportation Topics magazine. We value and understand awards like such cannot be achieved without the support and efforts from the many individuals and partnerships associated with Blakeman Transportation Inc. We would like to first thank our partnerships which are made up of our customers, carriers and those entity’s that are a part of our piece in the logistics move that make the freight move through the supply chain. Without the partnerships we have awards and accolades like this would not be possible. Secondly, the staff members of our organization. It is a continuous effort, daily, weekly, monthly, etc. to figure out the “Rubik’s cube”. Without the entire staff Blakeman Transportation would not be what it is today. The dedication to excellence and commitment to overcome constant challenges both expected and non-expected has built a foundation for guiding values and principles. We as a company would like to thank everyone involved, both internal and external, directly and indirectly associated with this recognition.